Angelo Dawkins is a proven success story when it comes to athletic achievements. During his collegiate days, this multi-faceted athlete captured National Titles in three different sports: Football, Wrestling and Track. Simply put, Angelo Dawkins thrives on competition and his distinctive ability to out-maneuver those who stand before him. With his entire focus now placed on the world of NXT, Angelo Dawkins plans to add another title to his growing resume – NXT Champion. June 20, 2013 – NXT: Sami Zayn defeated Angelo Dawkins (Debut). July 25, 2013 – NXT: Tyler Breeze (Debut) (New Gimmick) defeated Angelo Dawkins. January 3, 2014 – NXT Live Event: NXT tag team champions Konnor and Viktor defeated Angelo Dawkins and Colin Cassady in a non-title match. January 16, 2014 – NXT: Angelo Dawkins defeated Slate Randall in a dark match. March 29, 2014 – NXT Live Event: Angelo Dawkins defeated Danny Burch. April 19, 2014 – NXT Live Event: Angelo Dawkins and Colin Cassady defeated Bull Dempsey and Danny Burch. April 24, 2014 – NXT: Tyler Breeze defeated Angelo Dawkins. May 15, 2014 – NXT: Colin Cassady defeated Angelo Dawkins. May 23, 2014 – NXT Live Event: Camacho defeated Angelo Dawkins. May 24, 2014 – NXT Live Event: Angelo Dawkins defeated Camacho. June 19, 2014 – NXT: Aiden English and Simon Gotch defeated Angelo Dawkins and Travis Tyler. June 20, 2014 – NXT Live Event: Angelo Dawkins defeated Solomon Crowe. June 27-28, 2014 – NXT Live Event: Bull Dempsey defeated Angelo Dawkins. July 10, 2014 – NXT: Bull Dempsey defeated Angelo Dawkins. July 12, 2014 – NXT Live Event: Bull Dempsey defeated Angelo Dawkins. July 31, 2014 – NXT: Tyler Breeze defeated Angelo Dawkins. August 1-2, 2014 – NXT Live Event: Bull Dempsey defeated Angelo Dawkins. August 7, 2014 – NXT Live Event: Bull Dempsey defeated Angelo Dawkins. August 8, 2014 – NXT Live Event: Angelo Dawkins defeated Bull Dempsey. August 28, 2014 – NXT: Bull Dempsey defeated Angelo Dawkins. September 5-6, 2014 – NXT Live Event: Bull Dempsey defeated Angelo Dawkins. September 13, 2014 – NXT Live Event: Angelo Dawkins defeated Bull Dempsey. September 18-20, 2014 – NXT Live Event: Angelo Dawkins defeated Bull Dempsey. October 17-18, 2014 – NXT Live Event: Marcus Louis defeated Angelo Dawkins. October 30, 2014 – NXT Live Event: Dash Wilder and Scott Dawson defeated Angelo Dawkins and Sawyer Fulton. November 8, 2014 – NXT Live Event: Angelo Dawkins, Chad Gable and Sawyer Fulton defeated Elias Sampson, Hugo Knox and Steve Cutler. November 13-15, 2014 – NXT Live Event: Elias Sampson, Hugo Knox and Steve Cutler defeated Angelo Dawkins, Chad Gable and Sawyer Fulton. December 18-19, 2014 – NXT Live Event: Angelo Dawkins and Sawyer Fulton defeated Digg Rawlis and Cal Bishop. December 20, 2014 – NXT Live Event: Angelo Dawkins and Sawyer Fulton defeated Dash Wilder and Scott Dawson. January 16, 2015 – NXT Live Event: Dash Wilder and Scott Dawson defeated Angelo Dawkons and Sawyer Fulton. January 24, 2015 – NXT Live Event: Angelo Dawkins and Sawyer Fulton defeated Tony Briggs and Elias Sampson. January 30-31, 2015 – NXT Live Event: Dash Wilder and Scott Dawson defeated Angelo Dawkons and Sawyer Fulton. February 20, 2015 – NXT Live Event: Colin Cassady and Enzo Amore defeated Angelo Dawkins and Sawyer Fulton. March 29, 2015 – Wrestlemania Fan Axxess: Angelo Dawkins defeated Aiden English. March 4, 2015 – NXT: Blake and Murphy defeated Angelo Dawkins and Sawyer Fulton. April 9, 2015 – NXT Live Event: Solomon Crowe defeated Angelo Dawkins. April 15, 2015 – NXT: Colin Cassady and Enzo Amore defeated Angelo Dawkins and Sawyer Fulton. April 30, 2015 – NXT Live Event: Colin Cassady and Enzo Amore defeated Angelo Dawkins and Sawyer Fulton. May 7, 2015 – NXT Live Event: Bull Dempsey and Tucker Knight defeated Angelo Dawkins and Sawyer Fulton. May 8, 2015 – NXT Live Event: Angelo Dawkins and Sawyer Fulton defeated Bull Dempsey and Tucker Knight. May 23, 2015 – NXT Live Event: Angelo Dawkins defeated Tucker Knight. May 30, 2015 – NXT Live Event: The Vaudevillains defeated Angelo Dawkins and Sawyer Fulton. June 6, 2015 – NXT Live Event: Angelo Dawkins defeated Sawyer Fulton. June 24, 2015 – NXT: Mojo Rawley and Zack Ryder defeated Sawyer Fulton and Angelo Dawkins. June 26, 2015 – NXT Live Event: Marcus Louis defeated Angelo Dawkins. July 9, 2015 – NXT Live Event: Mike Rawlis defeated Angelo Dawkins. July 11, 2015 – NXT Live Event: Uhaa Nation defeated Angelo Dawkins. July 22, 2015 – NXT: The Vaudevillains defeated Angelo Dawkins and Sawyer Fulton. July 17, 2015 – NXT Live Event: Uhaa Nation defeated Angelo Dawkins. August 6, 2015 – NXT Live Event: Steve Cutler defeated Angelo Dawkins. August 8, 2015 – NXT Live Event: Bull Dempsey defeated Angelo Dawkins. August 28, 2015 – NXT Live Event: Enzo Amore and Colin Cassady defeated Angelo Dawkins and Sawyer Fulton in the 1st round. August 29, 2015 – NXT Live Event: Mojo Rawley defeated Angelo Dawkins. September 3-4, 2015 – NXT Live Event: Bull Dempsey defeated Angelo Dawkins. September 12, 2015 – NXT Live Event: Angelo Dawkins defeated Riddick Moss. September 24, 2015 – NXT Live Event: Angelo Dawkins defeated Noah Kekoa. September 25, 2015 – NXT Live Event: Angelo Dawkins and Sawyer Fulton defeated Solomon Crowe and Tucker Knight. October 14, 2015 – NXT: The Vaudevillains (Aiden English and Simon Gotch) defeated Angelo Dawkins and Sawyer Fulton. October 16, 2015 – NXT Live Event: Baron Corbin defeated Angelo Dawkins. October 30, 2015 – NXT Live Event: Angelo Dawkins defeated Steve Cutler. November 4, 2015 – NXT: Bull Dempsey defeated Angelo Dawkins. November 5, 2015 – NXT Live Event: Enzo Amore defeated Angelo Dawkins. November 6, 2015 – NXT Live Event: Hugo Knox defeated Angelo Dawkins. November 13, 2015 – NXT Live Event: Mojo Rawley defeated Angelo Dawkins. November 20, 2015 – NXT Live Event: The Vaudevillains (Aiden English and Simon Gotch) defeated Angelo Dawkins and Tino Sabbatelli. December 5, 2015 – NXT Live Event: Bull Dempsey defeated Angelo Dawkins. January 14, 2016 – NXT Live Event: Tino Sabbatelli defeated Angelo Dawkins. January 15, 2016 – NXT Live Event: Hugo Knox defeated Angelo Dawkins. January 16, 2016 – NXT Live Event: Angelo Dawkins defeated Tucker Knight. January 27, 2016 – NXT Live Event: The Hype Bros (Mojo Rawley nda Zack Ryder) defeated Angelo Dawkins and Kenneth Crawford. January 29, 2016 – NXT Live Event: Manny Andrade defeated Angelo Dawkins. January 30, 2016 – NXT Live Event: Hugo Knox defeated Angelo Dawkins. February 6, 2016 – NXT Live Event: Alex Riley defeated Angelo Dawkins. February 18, 2016 – NXT Live Event: Zack Ryder defeated Angelo Dawkins. February 26, 2016 – NXT Live Event: Apollo Crews defeated Angelo Dawkins. March 4, 2016 – NXT Live Event: Kenneth Crawford, Patrick Clark and Rich Swann defeated Angelo Dawkins, Gabriel Ealy and Uriel Ealy. March 10, 2016 – NXT Live Event: Tucker Knight defeated Angelo Dawkins. March 12, 2016 – NXT Live Event: Manny Andrade defeated Angelo Dawkins. March 16, 2016 – NXT: Mojo Rawley and Zack Ryder defeated Angelo Dawkins and Kenneth Crawford. March 18, 2016 – NXT Live Event: Apollo Crews defeated Angelo Dawkins. April 3, 2016 – NXT Live Event: Tucker Knight defeated Angelo Dawkins. April 8, 2016 – NXT Live Event: Tino Sabbatelli defeated Angelo Dawkins. April 9, 2016 – NXT Live Event: Angelo Dawkins defeated Christopher Girard. April 13, 2016 – NXT: Austin Aries defeated Angelo Dawkins. April 15, 2016 – NXT Live Event: Mojo Rawley defeated Angelo Dawkins. April 16, 2016 – NXT Live Event: Manny Andrade defeated Angelo Dawkins. April 22, 2016 – NXT Live Event: Tino Sabbatelli defeated Angelo Dawkins. April 23, 2016 – NXT Live Event: Angelo Dawkins defeated Tino Sabbatelli. May 4, 2016 – NXT: Manny Andrade defeated Angelo Dawkins in a dark match. May 6-7, 2016 – NXT Live Event: Tino Sabbatelli defeated Angelo Dawkins. May 12, 2016 – NXT Live Event: Angelo Dawkins defeated Dan Mantha. May 13, 2016 – NXT Live Event: Angelo Dawkins defeated Sawyer Fulton. May 14, 2016 – NXT Live Event: Hugo Knox defeated Angelo Dawkins. May 20, 2016 – NXT Live Event: Angelo Dawkins defeated Dylan Miley. May 27, 2016 – NXT Live Event: Angelo Dawkins defeated Tucker Knight. June 2, 2016 – NXT Live Event: Andrade Almas defeated Angelo Dawkins. June 4, 2016 – NXT Live Event: Andrade Almas defeated Angelo Dawkins. June 10, 2016 – NXT Live Event: Baron Corbin defeated Alexander Wolfe and Angelo Dawkins in a 3-way match. June 11, 2016 – NXT Live Event: Angelo Dawkins defeated Tucker Knight. Bobby Roode defeated Angelo Dawkins. June 12, 2016 – NXT Live Event: Tye Dillinger defeated Angelo Dawkins. Angelo Dawkins and No Way Jose defeated Alexander Wolfe and Sawyer Fulton. June 17, 2016 – NXT Live Event: Alexander Wolfe defeated Angelo Dawkins. June 25, 2016 – NXT Live Event: Andrade Almas defeated Angelo Dawkins. July 20, 2016 – NXT: Andrade Almas defeated Angelo Dawkins in a dark match. July 9, 2016 – NXT Live Event: Angelo Dawkins defeated Patrick Clark. July 14, 2016 – NXT Live Event: Hideo Itami defeated Angelo Dawkins. July 15, 2016 – NXT Live Event: Angelo Dawkins defeated Andrade Almas. July 16, 2016 – NXT Live Event: Hideo Itami defeated Angelo Dawkins. August 5, 2016 – NXT Live Event: Angelo Dawkins defeated Alexander Wolfe. August 6, 2016 – NXT Live Event: Alexander Wolfe defeated Angelo Dawkins. August 10, 2016 – NXT: Andrade Almas defeated Angelo Dawkins. August 12, 2016 – NXT Live Event: Tino Sabbatelli defeated Angelo Dawkins. August 13, 2016 – NXT Live Event: Angelo Dawkins defeated Dan Matha. September 8, 2016 – NXT Live Event: Alexander Wolfe and Sawyer Fulton defeated Angelo Dawkins and Kenneth Crawford. September 9, 2016 – NXT Live Event: Angelo Dawkins and Kenneth Crawford defeated Adrian Jaoude and Cezar Bononi. September 17, 2016 – NXT Live Event: Angelo Dawkins and Kenneth Crawford defeated The Ealy Twins (Gabriel Ealy and Uriel Ealy). September 30, 2016 – NXT Live Event: Angelo Dawkins was in a battle royal won by Dan Matha. October 1, 2016 – NXT Live Event: The Authors Of Pain (Akam and Rezar) defeated Angelo Dawkins and Kenneth Crawford. October 14, 2016 – NXT Live Event: Riddick Moss and Tino Sabbatelli defeated Angelo Dawkins and Kenneth Crawford. October 15, 2016 – NXT Live Event: #DIY (Johnny Gargano and Tommaso Ciampa defeated Angelo Dawkins and Kenneth Crawford. October 21, 2016 – NXT Live Event: Riddick Moss and Tino Sabbatelli defeated Angelo Dawkins and Kenneth Crawford. October 28, 2016 – NXT Live Event: Heavy Machinery (Niko Bogojevic and Tucker Knight) defeated Angelo Dawkins and Kenneth Crawford. October 29, 2016 – NXT Live Event: Riddick Moss and Tino Sabbatelli defeated Angelo Dawkins and Kenneth Crawford. November 3, 2016 – NXT Live Event: Angelo Dawkins and Kenneth Crawford defeated Riddick Moss and Tino Sabbatelli. November 18, 2016 – NXT Live Event: Riddick Moss and Tino Sabbatelli defeated Angelo Dawkins and Kenneth Crawford. December 10, 2016 – NXT Live Event: Angelo Dawkins and Kenneth Crawford defeated Ho Ho Lun and Tian Bing. January 11, 2017 – NXT: Angelo Dawkins and Montez Ford defeated Adrian Jaoude and Cezar Bononi in a dark match. January 12, 2017 – NXT Live Event: Angelo Dawkins and Montez Ford defeated Ariya Daivari and Mustafa Ali. January 19, 2017 – NXT Live Event: Angelo Dawkins and Montez Ford defeated Riddick Moss and Tino Sabbatelli. January 20, 2017 – NXT Live Event: SAnitY (Alexander Wolfe and Killian Dain) defeated Angelo Dawkins and Montez Ford. February 4, 2017 – NXT Live Event: Angelo Dawkins and Montez Ford defeated The Ealy Twins (Gabriel Ealy and Uriel Ealy). February 24, 2017 – NXT Live Event: Angelo Dawkins and Montez Ford defeated Riddick Moss and Tino Sabbatelli. March 16, 2017 – NXT Live Event: Angelo Dawkins and Montez Ford defeated Riddick Moss and Tino Sabbatelli. April 7, 2017 – NXT Live Event: Angelo Dawkins and Montez Ford defeated The Ealy Twins (Gabriel Ealy and Uriel Ealy). April 8, 2017 – NXT Live Event: The Authors Of Pain (Akam and Rezar) defeated Angelo Dawkins and Montez Ford to retain the tag team titles. April 12, 2017 – NXT: Angelo Dawkins and Montez Ford defeated Riddick Moss and Tino Sabbatelli in a dark match. April 28, 2017 – NXT Live Event: Angelo Dawkins and Montez Ford defeated Riddick Moss and Tino Sabbatelli. May 5, 2017 – NXT Live Event: Angelo Dawkins and Montez Ford defeated The Ealy Twins (Gabriel Ealy and Uriel Ealy). May 12, 2017 – NXT Live Event: Angelo Dawkins and Montez Ford defeated The Ealy Twins (Gabriel Ealy and Uriel Ealy). May 13, 2017 – NXT Live Event: Riddick Moss and Tino Sabbatelli defeated Angelo Dawkins and Montez Ford. May 17, 2017 – NXT: Angelo Dawkins and Montez Ford defeated Dylan Miley and Ho Ho Lun in a dark match. June 1, 2017 – NXT Live Event: Riddick Moss and Tino Sabbatelli defeated Angelo Dawkins and Montez Ford. June 2-3, 2017 – NXT Live Event: Angelo Dawkins and Montez Ford defeated The Ealy Twins (Gabriel Ealy and Uriel Ealy). June 30, 2017 – NXT Live Event: Angelo Dawkins and Montez Ford defeated The Ealy Twins (Gabriel Ealy and Uriel Ealy). July 6, 2017 – NXT Live Event: Angelo Dawkins and Montez Ford defeated The Ealy Twins (Gabriel Ealy and Uriel Ealy). July 7, 2017 – NXT Live Event: Angelo Dawkins and Montez Ford defeated Steve Cutler and Wesley Blake. July 14, 2017 – NXT Live Event: Street Profits (Angelo Dawkins and Montez Ford) defeated Riddick Moss and Tino Sabbatelli. July 22, 2017 – NXT Live Event: Street Profits (Angelo Dawkins & Montez Ford) and Yanbo Wang defeated Demitrius Bronson & The Ealy Twins (Gabriel Ealy and Uriel Ealy). July 28, 2017 – NXT Live Event: Angelo Dawkins and Montez Ford defeated Steve Cutler and Wesley Blake. July 29, 2017 – NXT Live Event: Asuka & The Street Profits (Angelo Dawkins and Montez Ford) defeated Riddick Moss, Sage Beckett and Tino Sabbatelli. August 3, 2017 – NXT Live Event: Street Profits (Angelo Dawkins and Montez Ford) defeated Riddick Moss and Tino Sabbatelli. August 9, 2017 – NXT: Street Profits (Angelo Dawkins and Montez Ford) defeated The Metro Brothers (Chris Metro and JC Metro). August 10, 2017 – NXT Live Event: Street Profits (Angelo Dawkins and Montez Ford) defeated Brennan Williams and Uriel Ealy. August 11, 2017 – NXT Live Event: Street Profits (Angelo Dawkins and Montez Ford) defeated Demitrius Bronson and Fabian Aichner. August 12, 2017 – NXT Live Event: Angelo Dawkins and Montez Ford defeated Steve Cutler and Wesley Blake. August 16, 2017 – NXT: Street Profits (Angelo Dawkins and Montez Ford) defeated Chris Silvio and Lars Sullivan. August 25, 2017 – NXT Live Event: Angelo Dawkins and Montez Ford defeated Steve Cutler and Wesley Blake. September 13, 2017 – NXT: Street Profits (Angelo Dawkins and Montez Ford) defeated The Ealy Twins (Gabriel Ealy and Uriel Ealy). September 21-24, 29 2017 – NXT Live Event: Street Profits (Angelo Dawkins and Montez Ford) defeated Riddick Moss and Tino Sabbatelli. September 28, 2017 – NXT Live Event: Street Profits (Angelo Dawkins and Montez Ford) defeated Fabian Aichner and Marcel Barthel. October 6, 2017 – NXT Live Event: Street Profits (Angelo Dawkins and Montez Ford) defeated Riddick Moss and Tino Sabbatelli. October 11, 2017 – NXT: Street Profits (Angelo Dawkins and Montez Ford) defeated Damien Smith and Markos Espada. October 13-14, 2017 – NXT Live Event: Angelo Dawkins and Montez Ford defeated Steve Cutler and Wesley Blake. October 20, 2017 – NXT Live Event: Angelo Dawkins defeated Tino Sabbatelli. October 21, 2017 – NXT Live Event: Angelo Dawkins defeated Ming. October 26-27, 2017 – NXT Live Event: Street Profits (Angelo Dawkins and Montez Ford) defeated Danny Burch and Oney Lorcan. November 4, 2017 – NXT Live Event: Street Profits (Angelo Dawkins and Montez Ford) defeated The Ealy Twins (Gabriel Ealy and Uriel Ealy). November 9, 2017 – NXT Live Event: Angelo Dawkins and Montez Ford defeated Steve Cutler and Wesley Blake. November 10-11, 2017 – NXT Live Event: Street Profits (Angelo Dawkins and Montez Ford) defeated Riddick Moss and Tino Sabbatelli. November 16, 2017 – NXT: Street Profits (Angelo Dawkins and Montez Ford) defeated Riddick Moss and Tino Sabbatelli. December 1-2, 2017 – NXT Live Event: Street Profits (Angelo Dawkins and Montez Ford) defeated Riddick Moss and Tino Sabbatelli. December 8, 2017 – NXT Live Event: Street Profits (Angelo Dawkins and Montez Ford) defeated The Ealy Twins (Gabriel Ealy and Uriel Ealy). December 14-16, 2017 – NXT Live Event: The Undisputed ERA (Bobby Fish and Kyle O’Reilly) defeated Street Profits (Angelo Dawkins and Montez Ford) to retain the NXT tag team titles. December 27, 2017 – NXT: Street Profits (Angelo Dawkins and Montez Ford) defeated Kris Starr and Riley Apex. January 5-6, 2018 – NXT Live Event: Street Profits (Angelo Dawkins and Montez Ford) defeated Riddick Moss and Tino Sabbatelli. January 12-13, 2018 – NXT Live Event: The Undisputed ERA (Bobby Fish and Kyle O’Reilly) defeated Street Profits (Angelo Dawkins and Montez Ford) to retain the NXT tag team titles. February 3, 2018 – NXT Live Event: Street Profits (Angelo Dawkins and Montez Ford) defeated Steve Cutler and Wesley Blake. February 7, 2018 – NXT: Street Profits (Angelo Dawkins and Montez Ford) defeated Fabian Aichner and Raul Mendoza in a dark match. February 8, 2018 – NXT Live Event: Street Profits (Angelo Dawkins and Montez Ford) defeated Adrian Jaoude and Cezar Bononi. February 9, 2018 – NXT Live Event: Street Profits (Angelo Dawkins and Montez Ford) defeated The Ealy Twins (Gabriel Ealy and Uriel Ealy). February 10, 2018 – NXT Live Event: Angelo Dawkins defeated Dan Matha. February 22, 2018 – NXT Live Event: The Undisputed ERA (Bobby Fish and Kyle O’Reilly) defeated Street Profits (Angelo Dawkins and Montez Ford) to retain the NXT tag team titles. February 23, 2018 – NXT Live Event: Street Profits (Angelo Dawkins and Montez Ford) defeated Adrian Jaoude and Cezar Bononi. March 1, 2018 – NXT Live Event: Street Profits (Angelo Dawkins and Montez Ford) defeated Adrian Jaoude and Cezar Bononi. March 2, 2018 – NXT Live Event: The Undisputed ERA (Bobby Fish and Kyle O’Reilly) defeated Street Profits (Angelo Dawkins and Montez Ford) to retain the NXT tag team titles. March 3, 2018 – NXT Live Event: Angelo Dawkins defeated Cezar Bononi. March 4, 2018 – NXT Live Event: The Velveteen Dream defeated Angelo Dawkins. March 14, 2018 – NXT: Street Profits (Angelo Dawkins and Montez Ford) defeated Heavy Machinery (Otis Dozovic and Tucker Knight) in the 1st round. March 28, 2018 – NXT: The Authors Of Pain (Akam and Rezar) defeated Street Profits (Angelo Dawkins and Montez Ford) in the semi-finals of the Dusty Rhodes tag team classic. March 30, 2018 – NXT Live Event: The Forgotten Sons (Steve Cutler and Wesley Blake) defeated Street Profits (Angelo Dawkins and Montez Ford). April 5, 2018 – WrestleMania Axxess: Street Profits (Angelo Dawkins and Montez Ford) defeated Adrian Jaoude and Cezar Bononi in the 1st round. April 7, 2018 – WrestleMania Axxess: Trent Seven and Tyler Bate defeated Street Profits (Angelo Dawkins and Montez Ford) in the semi-finals. April 19, 21, 2018 – NXT Live Event: Oney Lorcan & Street Profits (Angelo Dawkins and Montez Ford) defeated Chad Lail, Steve Cutler and Wesley Blake. April 20, 22, 2018 – NXT Live Event: Street Profits (Angelo Dawkins and Montez Ford) defeated The Forgotten Sons (Steve Cutler and Wesley Blake). April 26, 2018 – NXT Live Event: Street Profits (Angelo Dawkins and Montez Ford) defeated Adrian Jaoude and Cezar Bononi. May 3, 2018 – NXT Live Event: The Undisputed ERA (Kyle O’Reilly and Roderick Strong) defeated Street Profits (Angelo Dawkins and Montez Ford) to retain the tag titles. May 4, 2018 – NXT Live Event: NXT tag team champions The Undisputed ERA (Kyle O’Reilly and Roderick Strong) defeated Street Profits (Angelo Dawkins and Montez Ford) in a non-title match. May 12, 2018 – NXT Live Event: Street Profits (Angelo Dawkins and Montez Ford) defeated Dan Matha and Marcel Barthel. May 17, 2018 – NXT Live Event: Street Profits (Angelo Dawkins and Montez Ford) defeated The Forgotten Sons (Steve Cutler and Wesley Blake). May 18, 20, 2018 – NXT Live Event: The Undisputed ERA (Kyle O’Reilly and Roderick Strong) defeated Street Profits (Angelo Dawkins and Montez Ford) to retain the tag titles. May 19, 21, 2018 – NXT Live Event: Street Profits (Angelo Dawkins and Montez Ford) defeated The Forgotten Sons (Steve Cutler and Wesley Blake). June 2, 2018 – NXT Live Event: The Street Profits were in the #1 contenders battle royal for the NXT North American title won by Tucker Knight. June 30, 2018 – NXT Live Event: Angelo Dawkins defeated Rocky. August 4, 2018 – NXT Live Event: The Undisputed ERA (Kyle O’Reilly and Roderick Strong) defeated Street Profits (Angelo Dawkins and Montez Ford) in a no disqualification match to retain the tag titles. August 14, 2018 – NXT: Street Profits (Angelo Dawkins and Montez Ford) defeated The Mighty (Nick Miller and Shane Thorne). August 25, 2018 – NXT Live Event: Street Profits (Angelo Dawkins and Montez Ford) defeated Adrian Jaoude and Cezar Bononi. September 5, 2018 – NXT: The Forgotten Sons (Steve Cutler and Wesley Blake) defeated Street Profits (Angelo Dawkins and Montez Ford). September 7, 2018 – NXT Live Event: Danny Burch and Oney Lorcan defeated Street Profits (Angelo Dawkins and Montez Ford) to become #1 contenders for the tag team titles. September 28, 2018 – NXT Live Event: Street Profits (Angelo Dawkins and Montez Ford) defeated The Forgotten Sons (Jaxson Ryker and Wesley Blake). September 29, 2018 – NXT Live Event: Jeet Rama & Street Profits (Angelo Dawkins and Montez Ford) defeated Luke Menzies, Rinku Singh and Saurav Gurjar. October 11-13, 2018 – NXT Live Event: Street Profits (Angelo Dawkins and Montez Ford) defeated The Forgotten Sons (Jaxson Ryker and Wesley Blake). October 20, 2018 – NXT Live Event: Ricochet & Street Profits (Angelo Dawkins and Montez Ford) defeated The Undisputed ERA (Bobby Fish, Kyle O’Reilly and Roderick Strong). October 27, 2018 – NXT Live Event: Angelo Dawkins was in the #1 contender battle royal for the NXT North American title won by Stacey Ervin Jr..
October 28, 2018 – EVOLVE 114: Street Profits (Angelo Dawkins and Montez Ford) defeated The Doom Patrol (Chris Dickinson and Jaka) to win the tag team titles. November 1, 2018 – NXT Live Event: The Undisputed ERA (Kyle O’Reilly and Roderick Strong) defeated Street Profits (Angelo Dawkins and Montez Ford) to retain the tag team titles. November 3, 2018 – NXT Live Event: Street Profits (Angelo Dawkins and Montez Ford) defeated Adrian Jaoude and Cezar Bononi. November 9, 2018 – EVOLVE 115: Street Profits (Angelo Dawkins and Montez Ford) defeated The WorkHorsemen (Anthony Henry and JD Drake) to retain the tag team titles. November 10, 2018 – EVOLVE 116: Street Profits (Angelo Dawkins and Montez Ford) defeated AR Fox and Leon Ruff to retain the tag team titles. December 6, 2018 – NXT Live Event: Street Profits (Angelo Dawkins and Montez Ford) defeated Ric Bugez and Riddick Moss. December 7, 2018 – NXT Live Event: Street Profits (Angelo Dawkins and Montez Ford) defeated The Forgotten Sons (Jaxson Ryker and Steve Cutler). December 8, 2018 – NXT Live Event: Keith Lee & Street Profits (Angelo Dawkins and Montez Ford) defeated The Forgotten Sons (Jaxson Ryker, Steve Cutler and Wesley Blake). 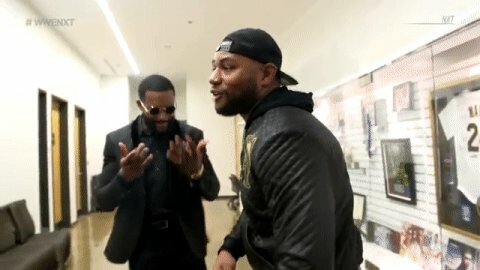 December 15, 2018 – EVOLVE 117: Street Profits (Angelo Dawkins and Montez Ford) (c) [Tag Team] vs. The WorkHorsemen (Anthony Henry and JD Drake (c) [WWN]) ended in a no contest. All titles retained. December 16, 2018 – EVOLVE 118: Street Profits (Angelo Dawkins and Montez Ford) defeated Austin Theory and Harlem Bravado to retain the tag team titles. January 4, 2019 – NXT Live Event: Street Profits (Angelo Dawkins and Montez Ford) defeated Adrian Jaoude and Cezar Bononi, Danny Burch and Oney Lorcan & Rinku Singh and Saurav Gurjar in a 4-way tag team elimination match. January 12, 2019 – NXT Live Event: Stacey Ervin Jr. & Street Profits (Angelo Dawkins and Montez Ford) defeated The Forgotten Sons (Jaxson Ryker, Steve Cutler and Wesley Blake). January 16, 2019 – NXT: Street Profits (Angelo Dawkins and Montez Ford) defeated The Metro Brothers (Chris Metro and JC Metro). January 18, 2019 – EVOLVE 119: Street Profits (Angelo Dawkins and Montez Ford) defeated The Skulk (Adrian Alanis and Leon Ruff) to retain the tag team titles. January 19, 2019 – EVOLVE 120: Montez Ford w Angelo Dawkins defeated Eddie Kingston. Josh Briggs defeated Angelo Dawkins w Montez Ford. January 24, 2019 – NXT Live Event: Street Profits (Angelo Dawkins and Montez Ford) defeated The Forgotten Sons (Jaxson Ryker and Steve Cutler). January 25, 2019 – NXT Live Event: Street Profits (Angelo Dawkins and Montez Ford) defeated The Forgotten Sons (Steve Cutler and Wesley Blake). January 30, 2019 – NXT: The Forgotten Sons (Steve Cutler and Wesley Blake) w Jaxson Ryker defeated Street Profits (Angelo Dawkins and Montez Ford). February 2, 2019 – NXT Live Event: Ricochet & Street Profits (Angelo Dawkins and Montez Ford) defeated The Forgotten Sons (Jaxson Ryker, Steve Cutler and Wesley Blake). February 8, 2019 – NXT Live Event: Street Profits (Angelo Dawkins and Montez Ford) defeated The Undisputed ERA (Bobby Fish and Kyle O’Reilly).